Our second fundraiser was success too! We tried "Bake sale" this time. We had limited time to prepare, but even on such short notice, many volunteer donated a lot of delicious baked goods. Also, we didn't have enough time to spread out the word, but we had many people stopped by! Thank you for Wal-Mart to give us a space to have this event, Mr. Virgil from John L Scott real estate to rent us supply. 31 decals, 112 wristbands, 9 Origami crane strap sales included! We have donated them to American Red Cross on 18th Monday already! We are appreciated your cooperation! We held Charity Bake Sale on this coming Sunday, 17th! 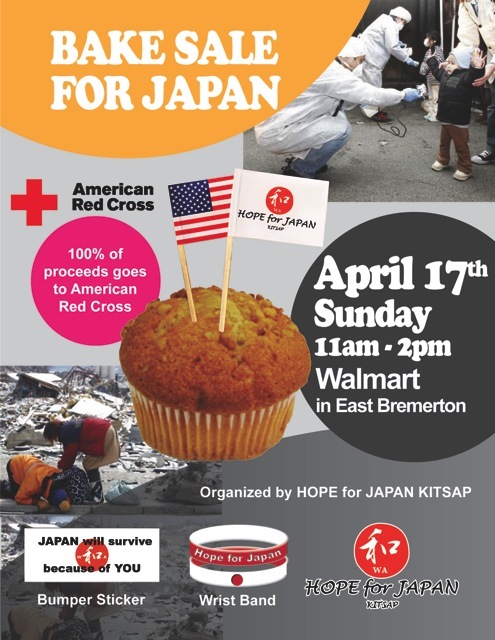 Location is front of Wal-mart in East Bremerton, from 11 am to 2 pm! Cup cakes, Cookies, Brownies, Belgian waffles, many kind of cakes and more! Also, we have bumper sticker, and our original new "Hope for Japan" wristband is arrived too! 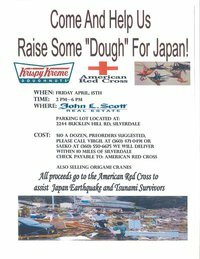 Raise Some "Dough" for JAPAN! Some of us will be there to support this event! They are selling Krispy Kream Doughnuts and Origami Cranes. Our the first fundraiser at Olympic College was a success!!! First, we would like to say Thank YOU to whom cooperate us! Also, we sincerely appreciate Olympic College for support! Including, offering us the place, and some equipments to have the fundraiser. Especially, ELS members! This is those two days result! Thank you very much for all volunteers, who came to help us, and who made many Origami cranes for us! We gave them as thank you gift for donation, and they love them. Once again, Thank you very much for your kind cooperation! Copyright © Hope for Japan Kitsap WA All Rights Reserved.